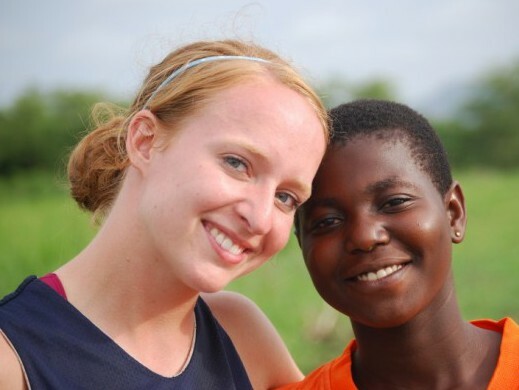 On May 12, 2008, the George Fox Women’s Basketball Team traveled three hours outside of Accra to Ho, in Ghana. Our group built a sports court for Sonrise Christian Secondary School, a new school of approximately 400 students that opened it’s doors three years ago. The primary language of the school, and of Ghana in general, is English. The group stayed on campus in the ‘dorms’ with the students. For most of the week, we took bucket baths; running water and electricity were a rarity, but in the process, we learned about simplicity and contentment. A direct result of the common language and staying on campus, was deep relationships forged between the American team and the Ghanaian students. It was amazing to see the way both groups impacted each other and broke down many stereotypes along the way. The people in Ghana were incredibly friendly and hospitable. At the school, the students would help carry our bags, bring us water for bathing, and even wash our clothes. At first we resisted their generosity, but by the end, came to be inspired and challenged by their service to one another, one of the hallmarks and deeply embedded values in their culture. We were also deeply moved by their joyful way of life, their singing, dancing and celebrating. They even taught the American girls a traditional tribal dance, the Bobobo. The court was a genuine partnership between the two groups. At times there were 80 people working on the court. As a result, we were able to finish the entire project in three days. The court will be used for basketball, volleyball, tennis and even badminton. Sport Court of Oregon donated a a state-of-the-art net system that will accommodate the three net sports. On the last day, the George Fox team did a camp for the students and taught them basketball. It was so inspiring to see the kids line up around the court so eager to learn how to play basketball. And then, as we were leaving, we saw a number of kids out on the court practicing the drills we taught them. The court will definitely get plenty of use! In addition to the court building project, the team also was able to play a soccer match against the school team, we traveled to the Village of Hope, an orphanage featured on the Oprah show, to teach the kids in the orphanage how to play basketball. We also did a canopy tour in the rainforest and visited the Elmina Slave Castle, the world’s largest slave castle, a haunting experience that was powerful and unforgettable. We noticed the crown that sat atop the biggest church in Amsterdam (we had a short layover in the city), was the same crown on the Elmina Castle walls. We noticed that directly above the slave dungeon was the Dutch Reformed Church building. What great lessons for our team about religion and power, and the dangers of a faith that is separated from and immune to human suffering.